gnome shell window manager (metacity?). Looks like a problem with pthread, but I struggled to find a solution. Also, I somehow think that might be connected with the segmentation-fault-problem. Sometimes updates tell you that you need to update certain library dependencies and if you miss it, you get weird errors down the road. With regards to the segmentation faults, I would recommend sys-apps/memtest86+ for a time, to see if the problem clearly lies there. It's where most of mine have been lurking at, especially so if the faults are seemingly random'ish, and not for example happening always at the same point of <a thing>. Nice catch Chiitoo! I usually look at software before hardware, but clearly this is a hardware problem. 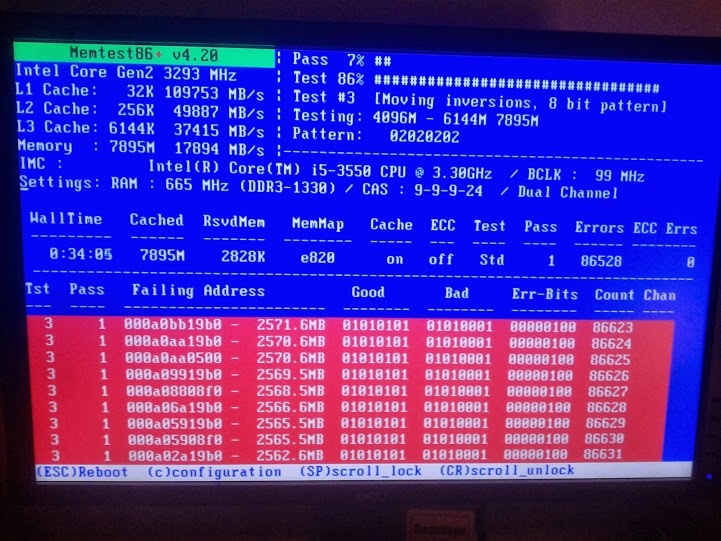 Is your RAM still under warranty? If so you can probably RMA it. Really looks like a hardware problem (RAM). I booted Windows and it first behaved strange, then showed me a blue screen. Unfortunately my RAM is almost 3 years old, so I probably have to buy new ones. I seem to remember many having a lifetime warranty, or at least a very long one (10 years for example). I'm sure exceptions exist. I might also venture trying the failing stick of memory in another port of the motherboard to see if they would disappear, although that might be unlikely. I don't think I ever noticed a difference doing that (as in, suspecting the motherboard itself instead of the stick of RAM).